I was bored the other night and so I wrote several Haiku about some of the things that generally piss me off (in a way that's enough to rile me up but not in a violent way, that is.) I figured, I'm uselessly releasing pent-up mental tirades anyway, so I might as well put some creative effort into it. In short, these are just silly pet peeves that I've decided to put into short phrases. Worse and Worst. And "In Lieu Of"
so don't start now, k? I'm going to our province (in Quezon) tomorrow for my grandfather's birthday. His birthday partaaay will be held at my parent's new house. I've never seen the new house, but its the fruit of my dad's year-long labor (and retirement fund), so it's probably something worth seeing. Plus, the last time I was in Quezon was 2, maybe 3 years ago. No cable tv, no internet, and no signal for my Globe cellphone. It's gonna be an eventful weekend, I guess. See ya. Now playing: Mogwai - I Know You Are But What Am I? The tennis season just ended (well, is almost ending, there's still the Davis Cup final, which I don't care about because it's not like the Philippine team is in the mix of the competition), and here's the year-end rankings for the ATP and WTA Tours. The biggest news on the men's side is the exchange of positions between Roger Federer and Rafael Nadal as the World #1 and Wimbledon Champion. Fed was ranked #1 for a record 237 straight weeks from Feb 2004 until August 2008, and has owned Wimbledon from 2003 to 2007. This year was a different story for him though, as he lost his dominance over the ATP Tour. Of course, he can take solace on the fact that he won an Olympic gold medal for Men's Doubles (with Stan Wawrinka) and he's just 1 Grand Slam title away from equalling Pete Sampras' record 14 Grand Slam titles when he won his 5th consecutive US Open title last September. And the fact that he's Roger Federer. Novak Djokovic and Andy Murray also comfortably stepped up into the big stage this year, and for the first time in years, there are actually 4 players seriously, legitimately, notproductofhypely in the running for next year's Grand Slams and for the #1 ranking. On the women's side, Justine Henin is still retired, and her retirement has definitely put a gaping hole at the top of women's tennis. 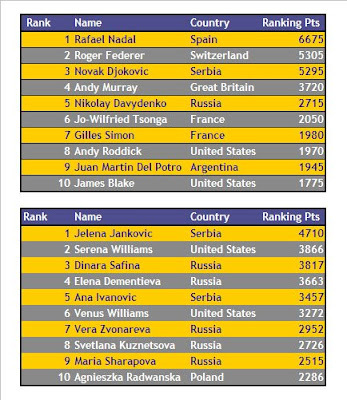 Proof: Jelena Jankovic is the World #1 , while the two other players who were ranked #1 post-Henin are now ranked 5 (Ivanovic) and 9 (Sharapova). I like Jelena, but there's no way she'd be #1 if Justine was around. Of course, given all the active players in the WTA Tour, I'm not surprised that it was JJ who ended up being #1. The Williams sisters are both great tennis players, but they just done play enough, and aren't consistent enough to take the #1 ranking. Ana and Maria both took the #1 ranking but both also took a ranking nosedive after being injured and failing to come back strong (or in Maria's case, at all), and all the other Russians in the top 10 have one weakness too many in their games. JJ on the other hand is consistent in getting to the semis and the finals of the many tournaments that she joins. She's never won a Grand Slam title, but based on the numbers she's clocked in, JJ deserves that #1 ranking. So what am I looking forward to in the WTA Tour next year? Well, more like who: Caroline Wozniacki and Arantxa Rus. They're all great, right? I don't know what it says about my current state of mind, or if it's just completely coincidental. But it does make me want to start thinking, except that involves too much effort. I was talking to my friend and former teammate Karon to make sense of some things, and well, I still don't know. I'm not that good with introspection, my mind always sidetracks me. Had a great time last Wednesday, celebrating my team lead Jonpe's and my former team lead Seph's new roles. The pics are over here. It was a fun night with the free food and beer, and the all-night karaoke. But what really made it awesome was when one of our teammates suddenly was given a rose by a "mystery" guy. What's funnier is my teammates went out to investigate who the "mystery" rose-sender was, and they were given the most obvious clue about who it was by the staff who delivered the rose... ROTFLMAO! Some things just align in a way that makes you think the universe intended them to happen exactly like that, and some things, well, not quite sometimes. Nickelodeon is back on my cable. I can finally watch Fairly-Odd Parents again. Yay. The Amazing Race 13 had teams going to Siem Reap, Cambodia last episode. Woohoo! They went to Angkor Wat for the roadblock task (where teams had to look for the Chamber of Echoes, which I think I found when I was there, but I had no idea that it was a chamber where you had to thump your chest to hear an echo), and to Bayon Temple for the pit stop. Awesome awesome awesome! Krispy Kreme has some new Reese-flavored donuts. Which will probably make me fatter because I love Krispy Kreme, and I love chocolate, and I love peanut butter. (I just took home a half dozen box of donuts for the weekend, right now only two are left.) Hurray for my belly!